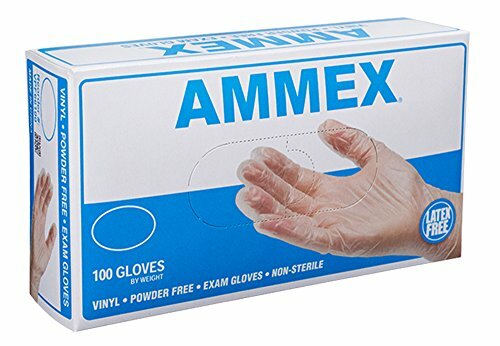 AMMEX Vinyl Exam disposable gloves are FDA approved for medical use and offer an affordable and effective barrier protection, against bloodborne pathogens. These premium vinyl gloves are latex free and are perfect for those concerned with latex sensitivities. Vinyl is less elastic than nitrile and latex, giving it a looser fit and smooth, comfortable feel, with excellent sensitivity in the palm and fingertips. They offer a bead at the base of the cuff that is 4 times thicker to prevent ripping or tearing at the wrist AMMEX Vinyl Exam disposable gloves are also less expensive than both latex and nitrile, making them a popular, cost effective option. They are powder free, so in medical applications, you won’t have to worry about messy powder residue. Vinyl exam grade gloves are commonly used for medical, dental, child care and senior care. Around the home, these vinyl gloves can be used for personal care, first aid, child care, senior care, pet care, arts and crafts. The best exam grade vinyl gloves for the price on Amazon prime. Superb tensile strength - Approved for medical application. Powder free - no messy residue. Ambidextrous for efficient glove changes. Sizes range from small to extra large - The glove is 9.5 inches long measured from the tip of the finger to the cuff of the glove.